Wendy Taylor Charney was a latecomer to serious training for the hurdles, but quickly rose to distinction on the provincial, university and Canadian scene. 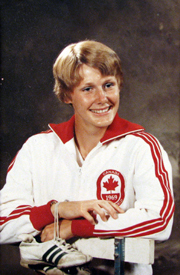 She earned her first gold medal in 1969 at the Canada Games in Halifax, and by 1973, she had climbed to the top of the podium at the Canadian Senior Championships. On the international scene, Taylor Charney was a Canadian team member for the Edinburgh Commonwealth Games (1970) and for the World Cup (1973) where she achieved her top performance with a sixth-place finish in the world. A trendsetter in training, Taylor Charney was one of the first female track athletes to make weight training an integral part of her physical preparation. Recovering from a severe leg injury in 1972, she still hurdled to a gold medal finish later that season at the Canadian Senior Championships.